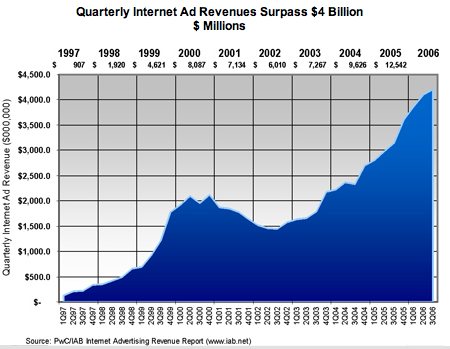 From John Battelle's weblog John Battelle's Searchblog: Internet Revenue Breaks $4 Billion. Online revenues hit $4.2 billion in Q3, up 2 percent over Q2 earlier this year ($4.1 b), Interactive Advertising Bureau and PricewaterhouseCoopers LLP announced today. This quarter is also 33 percent higher than $3.1 billion in Q3 2005. Sheryl Draizen, SVP and General Manager of IAB, notes, "Marketers are experiencing how this medium enhances their ability to target and engage the audience that matters to their brand and then measure its effectiveness in ways no other medium provides."